So far I have not been able to find a clear example of a Pretzel sword from a Danish church depiction, but this is the closest match I have found so far. This is a great example, your searching has paid off! Is it the first depiction of the multiple fullers that you have found in the frescos? The cross is a little puzzling... I know one of the museums holding a pretzel-hilt (forget which) claims that the pretzel-hilt was a later replacement to the original cross. I don't know what the basis of that claim was, but maybe this fresco is a clue in that direction also. I was going to say that it was odd to see Matthew depicted with a sword (which is usually the attribute of St. Paul) but it is apparently a known variant in iconography. I could be the earliest clearly multi-fullered blade from Danish churches, but I have to check more thoroughly to be sure if its the only one. Oh I can't remember seeing that info. It is certainly interesting if the cross-guard was removed and a pretzel inserted instead. They must likely candidate would be going from a C-guard (like the Hinge Sø swords) to a pretzel-guard. I have found that looking for swords in Denmark at least you get this ranking. 1) St Paul - almost always jackpot. 3) St George - most often with lance, but also with swords in the belt and occasionally in the hand. 4) St Matthew - some pictures in Denmark with him bearing swords. 1) Herod's killing of the Babies - very good for common soldiers equipment! 2) Jesus as world Judge - having a sword in (or occasionally out) of his mouth. 3) Mary with sword in her heart. 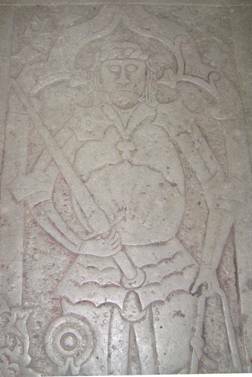 Found a a gravestone from Ringsted (Sankt Bendts Kirke) of Herremand Niels Pedersen (Gyldenstjerne) til Aagaard, who died 1456. He was possibly knighted at the coronation of King Christoffer III of Bavaria in 1441 as Swedish King. [Christoffer III was crowned as Norwegian King in 1442 and Danish King in 1443]. Niels Pedersen was originally buried in Næstved, but his grave and body was moved to Ringsted in 1530. As the gravestone is commissioned by his son - Mourids Nielsen (Gyldenstjerne) - who lived from ~1440-1503/04, the gravestone is commissioned at some point between the deaths of the father and son. It's not a pretzel sword (have upturned quillons), but the handle and pommel looks very much like the pretzel swords found in Nationalmuseet.